Professor Abdul Mannan, Chairman, University Grants Commission, Bangladesh, was honoured with the honorary D. Litt. 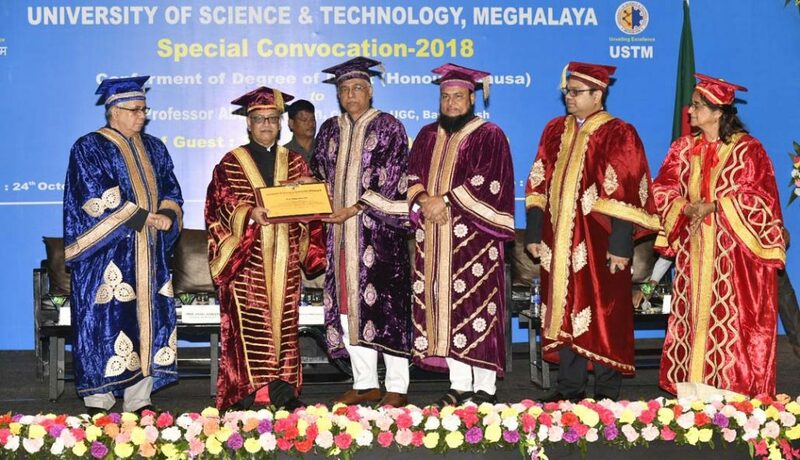 degree by the University of Science & Technology Meghalaya (USTM) at a special convocation ceremony held at Guwahati on Wednesday. The occasion was graced by Assam’s Education Minister Siddhartha Bhattacharya, Gauhati University VC Dr Mridul Hazarika, National Law university VC Dr JS Patil, Assam Science and Technology University VC Dr Dhiraj Bora, IASST Director Prof NC Talukdar, Assam Down Town University VC Dr Amarjyoti Choudhury and others. On this auspicious occasion, Assam’s Education Minister Bhattacharya and the UGC Chairman of Bangladesh discussed with Vice Chancellors of Universities and Directors of Institutions from Assam and Meghalaya on ‘Bilateral Collaboration Opportunities in the Field of Higher Education between Bangladesh and North East India’. The discussion programme was jointly organized at Guwahati by USTM and Assistant High Commissioner of Bangladesh, Guwahati, stated a USTM press communique. Welcoming the august gathering, Mahbubul Hoque, Chancellor of USTM expressed his gratefulness to the UGC Chairman, Bangladesh for accepting the honour bestowed by USTM. Dr PK Goswami, Vice Chancellor of USTM took forward the proceedings of the special convocation ceremony. The honorary D. Litt degree was handed over to Prof Abdul Mannan by minister Bhattacharya. He said that the relationship between India and Bangladesh will be lasting forever. The Bangladesh UGC Chairman will also address the 3rd Dr APJ Abdul Kalam Memorial Lecture organized by USTM on October 25. The annual lecture, organized in the honour of Dr Kalam, will be attended by students, teachers and dignitaries, including Prof Ved Prakash, Formar UGC Chairman and Prof Sanjay Deshmukh, Former Vice Chancellor, Mumbai University. Minister Bhattacharya after attending the programme stated on his Twitter handle that he was glad to attend the programme organised by USTM.